Both the new Samsung Galaxy S7 and S7 edge boast optical image stabilization to accompany the brand new 12 MP camera inside that this time has eschewed the megapixel race for 56% larger pixels than what we have on the S6. Between the new sensor, and the wider f/1.7 aperture, Samsung said that the S7 unit would collect 95% more light than the S6 in the same scenario, but that's not all there is to it. Besides a new lens/sensor combo, Samsung also equipped the camera on the S7 with a Dual Pixel focusing system for the first time in a phone, which uses all of the pixels for focusing, instead of just 5-10% of them, making continuous autofocus switch in video almost seamless. Coupled with the OIS system, these should do wonders in video recording, that is why we took both the Galaxy S7, and Apple's finest iPhone 6s Plus (which also has OIS), and made a video with one on top of the other to demonstrate how well the optically-stabilized 12 MP shooterс perform on both. Granted, the S7 unit at hand may not be fully optimized in terms of software yet, so we wouldn't comment on the quality of the footage just yet, and still this comparison above should give you a pretty good overview what to expect from the S7 video recorder against a fine snapper like the iPhone 6s Plus. Look the same to me. IKR ! This OIS comparison was so stupid. Who tests OIS by standing almost at the same spot. The phone might have been tied down in which case walking a step would be all you would have. He should have just walked in one place, just simulating movement. I hope you're joking. OIS is designed to dampen slight movements, not erratic bumping around and wild panning. Those "walking tests" are no more conclusive than firing a pellet gun at a phone screen to test its scratch resistance. Pause the video at any point when it's panning across. The iPhone is twice as blurry than the S7. HUGE difference. The auto focus of the S7 is amazing. SAME? Stop the vid and look at the letters on the walls. Wow iPhone shots are sooo motion blurred. Agreed. I was pretty impressed by iphone 6S and 6S + video taking but this is even better. Colors look better. Much less blur too. nice camera on the S7 i must admit. Somethings not right. It's clearer on the ip6+ but the S7 is slightly blury. Could be the settings or maybe OIS on the S7 is bad. Still on reproduction unit. Software tweak. @S.R.K Samsung has always played catch-up with iPhone, and probably always will...! I'm afraid Samsung is the 'under-dog'... Yes, iPhone's video has better color correction and are more sharper...! PA mentions it's still a premium production unit. RoTfLmFaO. A outdated brand company vs a technology company. Lmfao. Even thier A9x custom made Cpu lags behind Exynos 8890. Apple can't even afford to use Super Amoled display on thier iPhones. May I ask what parallel universe did you come from? You must have been living in your basement to long. The last 5 phones from Samsung have had better cameras than the last 5 phones by Apple. The Note 3, S5, S6, Note 4 and Note 5 ALL ahve better cameras from Sony, just liek Apple uses sensors from Sony and Samsung does a betetr job with them over Apple and Sony themselves. You sound so foolish when you idiots just purposely lie. 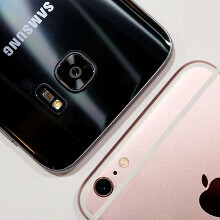 Samsung S and Note phones have been ahead of Apple as far as quality and features since 2011. Last time I check, Apple has never sold 300M to 400M+ phones EVER. So who's actually playing catchup? Now go ahead and bring Apple single models sells lie a typical Apple fanboy idiot typically tries to argue. Go ahead and bring up Apple's profit numbers. Because that is the only useless BS, you guys ever argue. You cant argue hardware vs hardware because you will lose every single time trying to justify paying $649 for a mid-ranged iPhone trying to be sold as a flagship. You are clearly Trolling. There is no way an unbiased person would say what you just said. Apple hasn't put out a world class leading piece of hardware in YEARS! Apple has been riding it's wave while others mainly Android have innovated with their OS & hardware. What about the A9 ? That's a class leading piece of tech. There is no equivalent to it. Can't even see one anywhere. So it could be at most equivalent to nothing for now. Iphone looks blurry to me! Pause the video in-between and you can see how fast S7 focuses. Spot on even, and both take some beautiful video. No its not even. The ip6s+ is faintly better.